Already serving both Washington Reagan National and Baltimore Washington International airports, the carrier will launch 68 weekly flights to 14 destinations from Dulles International Airport from August this year. US ultra low-fare carrier Frontier Airlines has announced plans to establish its first links to Washington Dulles International Airport as it establishes the US capital as a new focus city. Already serving both Washington Reagan National and Baltimore Washington International airports, the carrier will launch 68 weekly flights to 14 destinations from Dulles from August this year. The new routes from Washington Dulles will kick-off on August 19, 2014 when Frontier will introduce links to Atlanta, Charlotte, Minneapolis/St. Paul, Orlando and Tampa. These will be supplemented from September 8, 2014 by services to Chicago O’Hare, Cincinnati, Detroit, Fort Lauderdale, Fort Myers, Las Vegas, Memphis, St Louis and the St Augustine/Jacksonville area. The routes will be flown with between three and seven weekly frequencies using 168-seat A320s, although the St Louis link will be flown with a smaller A319. Frontier has been serving the Washington market regularly from its Denver International Airport hub, originally serving both Baltimore Washington International and Reagan National. It now just serves Denver from Reagan National but has previously also offered links to Grand Rapids, Kansas City, Milwaukee, Madison and Omaha from the airport during the 2010s. At Baltimore Washington International seasonal links are now offered to Philadelphia and Punta Cana, Dominican Republic between August and December each year. In the table below we look at each of the new destinations it will serve from Washington Dulles and look at the O&D demand and competition it will face on the routes, based upon flight schedules in September 2014. 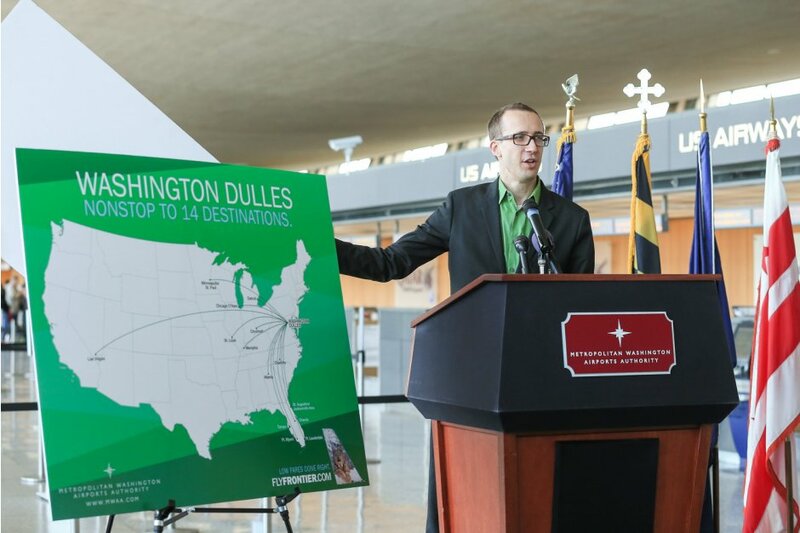 Over the past decade, Dulles International Airport has consistently made headlines for expanding non-stop international service from Washington to cities around the world, but the domestic offering from Frontier Airlines will see increased competition on ten routes and the addition of four new cities to the Dulles network. St Augustine is the only completely new market, but Fort Lauderdale has not been served since May this year, Fort Myers since 2010 and Memphis since 2009. “The addition of Frontier to the Dulles family represents a significant, positive development for passengers interested in additional low cost, domestic travel options to and from the National Capital region,” said Jack Potter, president and chief executive officer, Metropolitan Washington Airports Authority (MWAA). MWAA anticipates that the low-fares on offer from Frontier will help to stimulate the market considerably and also expects to generate demand from across Washington include the city's other airports. Passengers can regularly drive some distance to any of the three airports depending upon their travel needs and with fares from just $39 on offer from Frontier this is expected to see this rise. In the table, above, we also highlighted the O&D demand to each of the new Frontier destinations from not just Dulles International but also Baltimore Washington International and Reagan National. The total Dulles market equates to 3.2 million O&D passengers and is part of a much larger market. 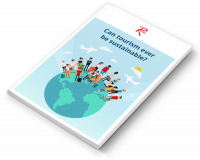 When taking Reagan National and Baltimore Washington into account, the total demand to these destinations from the region is over 13.3 million O&D passengers. The network growth coincides with a number of changes taking place at Dulles -enhanced parking options, a concourse makeover and the introduction of new food, beverage and retail options throughout the year. “With the Washington area economy growing and the Metrorail Silver Line on the way, Dulles will continue to fill the expanding air travel needs for the region and these new options from Frontier will play an important role,” added Potter. In the analysis below we look at the growth of domestic and international capacity from Washington Dulles International Airport over the past ten years.